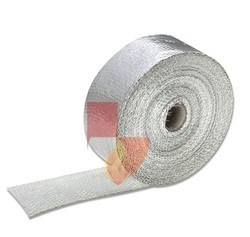 Fiberglass Insulation Tape by texturized E-glass fiber yarn is designed as a replacement for Asbestos / Ceramic Fabric has no known hazard towards environments. Designed to expand and contract, these extremely flexible Fiber glass fabric (E-type) can withstand continuous exposure of 1200°F / 650°C, has low thermal conductivity coefficient and are completely non-combustible. 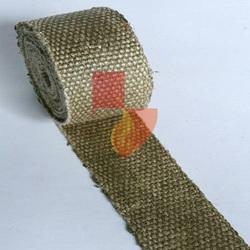 They are widely used as Heat Insulation Pads on Pipe wrap and can also be used for industrial ovens, furnaces, boilers and wood burning stoves, crucible packing and pollution control equipment; high temperature tying and lacing cords; and tadpole tape / gasket core ropes.The basic fiber is manufactured in accordance with specifications outlined in ASTM D-578, ASTM committee D13, and subcommittee D13 1B. Fiberglass Insulation Strip by texturized E-glass fiber yarn is designed as a replacement for Asbestos / Ceramic strip has no known hazard towards environments. Designed to expand and contract, these extremely flexible Fiber glass strip (E-type) can withstand continuous exposure of 1200°F / 650°C, has low thermal conductivity coefficient and are completely non-combustible. 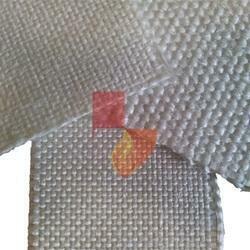 They are widely used as Heat Insulation Pads on Pipe wrap and can also be used for industrial ovens, furnaces, boilers and wood burning stoves, crucible packing and pollution control equipment; high temperature tying and lacing cords; and tadpole tape / gasket core ropes.The basic fiber is manufactured in accordance with specifications outlined in ASTM D-578, ASTM committee D13, and subcommittee D13 1B. Aluminized Fiberglass Tape reflect up to 95% of heat, with no organic flame contribution and provides a tough, impermeable, heat reflective coating that allows the fiberglass fabric to be used in a variety of demanding applications. The base fabric is heat cleaned to set the weave and reduce fraying when cut and then laminated to aluminum foil to provide a vapor barrier. Aluminized fiberglass fabric is specifically designed for fabric used for pipe wrapping and engine exhaust pipes. The base E-type Fiberglass fabric will support continuous operating temperatures of 1200°F (649°C) with peak temperatures to 1300°F (705°C). 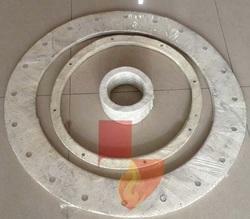 Although the aluminum layer is considered to be sacrificial at temperatures above 600°C the aluminum will withstand continuous operating temperatures in the 315°C range with no significant degradation. However, long term exposure at temperatures above 315°c will ultimately degrade the adhesive used to laminate the aluminum to the cloth substrate. Non itchy Fiberglass Tapes are braided by texturized E-glass fiber yarn is designed as a replacement for Asbestos / Ceramic Tapes has no known hazard towards environments. Designed to expand and contract, these extremely flexible Tetraglass wraps (E-type) can withstand continuous exposure of 1200°F / 650°C, has low thermal conductivity coefficient and are completely non-combustible. They are widely used as Heat Insulation Pads on Pipe wrap and can also be used for industrial ovens, furnaces, boilers and wood burning stoves, crucible packing and pollution control equipment; high temperature tying and lacing cords; and tadpole tape / gasket core ropes. The basic fiber is manufactured in accordance with specifications outlined in ASTM D-578, ASTM committee D13, and subcommittee D13 1B. Non itchy Fiberglass Ropes braided / twisted by texturized E-glass fiber yarn is designed as a replacement for Asbestos / Ceramic Rope has no known hazard towards environments. Designed to expand and contract, these extremely flexible Fiber glass ropes (E-type) can withstand continuous exposure of 1200°F / 650°C, has low thermal conductivity coefficient and are completely non-combustible. They are widely used as Heat Insulation Pads on Pipe wrap and can also be used for industrial ovens, furnaces, boilers and wood burning stoves, crucible packing and pollution control equipment; high temperature tying and lacing cords; and tadpole tape / gasket core ropes. The basic fiber is manufactured in accordance with specifications outlined in ASTM D-578, ASTM committee D13, and subcommittee D13 1B. Non itchy Fiberglass Gasket are braided by texturized E-glass fiber yarn is designed as a replacement for Asbestos / Ceramic Gaskets has no known hazard towards environments. Designed to expand and contract, these extremely flexible Gaskets (E-type) can withstand continuous exposure of 1200°F / 650°C, has low thermal conductivity coefficient and are completely non-combustible. They are widely used as Heat Insulation Pads on Pipe wrap and can also be used for industrial ovens, furnaces, boilers and wood burning stoves, crucible packing and pollution control equipment; high temperature tying and lacing cords; and tadpole tape / gasket core ropes. The basic fiber is manufactured in accordance with specifications outlined in ASTM D-578, ASTM committee D13, and subcommittee D13 1B. Silicone Coated Fiberglass Cloth is a flexible high temperature cloth available with either a single or double silicone rubber coating. This provides excellent resistance to heat and weather. Silicone coated glass cloth is designed to meet the requirements for use in nuclear reactors and widely used for welding protection, grinding protection, and is often used on the cold side of insulation fabrications. Aluminized Fiberglass Fabric up to 95% of heat, with no organic flame contribution and provides a tough, impermeable, heat reflective coating that allows the fiberglass fabric to be used in a variety of demanding applications. The fabric is heat cleaned to set the weave and reduce fraying when cut and then laminated to aluminum foil to provide a vapor barrier. Aluminized fiberglass fabric is specifically designed for fabric used for removable blankets, pipe wrapping, turbine blankets, fittings, flange covers and engine exhaust pipes. The base E-type Fiberglass fabric will support continuous operating temperatures of 1200°F (649°C) with peak temperatures to 1300°F (705°C). Although the aluminum layer is considered to be sacrificial at temperatures above 600°C the aluminum will withstand continuous operating temperatures in the 315°C range with no significant degradation. However, long term exposure at temperatures above 315°c will ultimately degrade the adhesive used to laminate the aluminum to the cloth substrate. 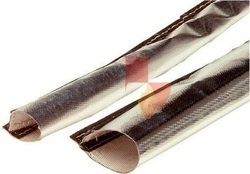 Non itchy Aluminized Fiberglass Sleeve are braided by texturized E-glass fiber yarn is designed as a replacement for Asbestos / Ceramic Sleeve has no known hazard towards environments. Designed to expand and contract, these extremely flexible Tetraglass sleeves (E-type) can withstand continuous exposure of 1200°F / 650°C, has low thermal conductivity coefficient and are completely non-combustible. 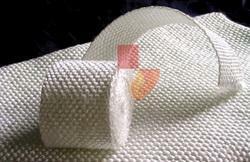 They are widely used as Heat Insulation Pads on Pipe wrap and can also be used for industrial ovens, furnaces, boilers and wood burning stoves, crucible packing and pollution control equipment; high temperature tying and lacing cords; and tadpole tape / gasket core ropes.The basic fiber is manufactured in accordance with specifications outlined in ASTM D-578, ASTM committee D13, and subcommittee D13 1B. Wire Reinforced Silicone Coated Fiberglass Cloth is a flexible high temperature cloth available with either a single or double silicone rubber coating. This provides excellent resistance to heat and weather. Silicone coated glass cloth is designed to meet the requirements for use in nuclear reactors and widely used for welding protection, grinding protection, and is often used on the cold side of insulation fabrications. 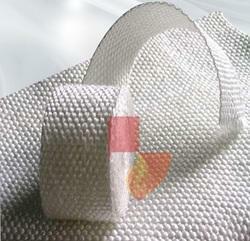 Fiberglass Cloth by texturized E-glass fiber yarn is designed as a replacement for Asbestos / Ceramic Fabric has no known hazard towards environments. Designed to expand and contract, these extremely flexible Fiber glass fabric (E-type) can withstand continuous exposure of 1200°F / 650°C, has low thermal conductivity coefficient and are completely non-combustible. 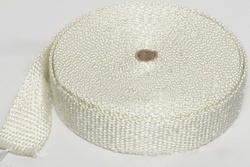 They are widely used as Heat Insulation Pads on Pipe wrap and can also be used for industrial ovens, furnaces, boilers and wood burning stoves, crucible packing and pollution control equipment; high temperature tying and lacing cords; and tadpole tape / gasket core ropes.The basic fiber is manufactured in accordance with specifications outlined in ASTM D-578, ASTM committee D13, and subcommittee D13 1B. Looking for Fiberglass Products ?